The French Village Pool is big and rectangular like an Olympic-sized swimming pool. It draws a crowd in the afternoon, but there is plenty of room for swimming. There is a shallow kiddie pool alongside the main pool making it a good choice for parents, too. The Infinity Pool in the Key West Village is a much smaller rectangular pool that's no bigger than an inground pool that you'd find at someone's house. It's usually empty in the mornings, making it a good choice for someone who wants to swim short lengths. Beaches’ Cascades Pool in the Caribbean Village is a big pool that never seems to get too crowded. It’s great for floating around. 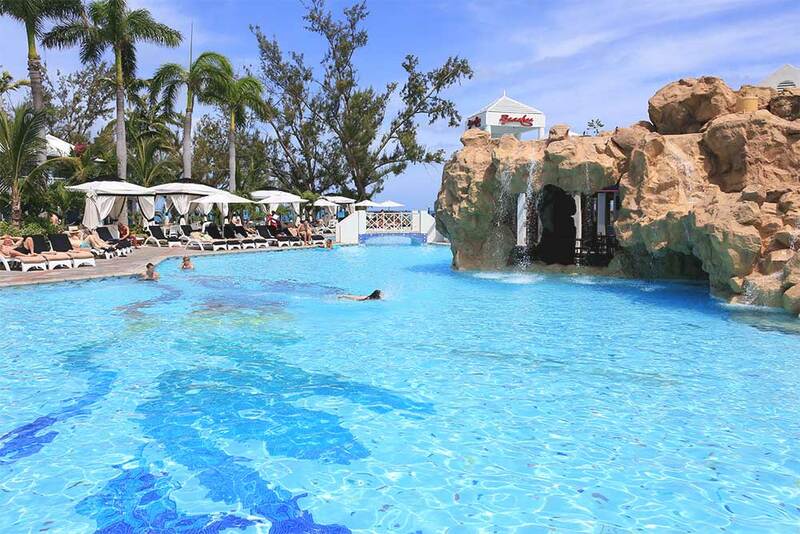 The Cascades Pool in the Caribbean Village is one of the least crowded on the resort. It's big an L-shaped and has man-made waterfalls and a grotto. It's a fun place to float around to wherever the water takes you. Get there early to score a foam float (there aren't many). The Riviera Bar has lots of seating and the fastest drink service of any swim-up bar on the resort. The only downside is that the bar is in direct sunlight for the entire day. The West Village Pool is an adults-only pool in the Key West Village, the most laid-back of all the villages during daytime hours. You won’t see the Italian Village Pool empty unless you wake up early. By 10 a.m., the lounge chairs start to fill and by noon, the pool is hopping. The pools in the French Village and the Italian Village each have a connected kiddie pool. Parents with young children might prefer the mellowness of the French Village. Older kids will almost certainly prefer the Italian pool. Iguanas Pool is popular with teenagers. There is a volleyball net strung across the pool. Swim-offs and water polo games are also held in this pool. The Italian Village Pool is the most crowded on the resort. This is the place to meet people and have a drink while the kids play. Pirates Island Waterpark has a small, shallow pool beside Bobby Dee's restaurant with a swim-up pool bar for kids (serving "mocktails" and juices). It's a good place for kids to meet each other and parents can relax on the lounge chairs beside the pool.